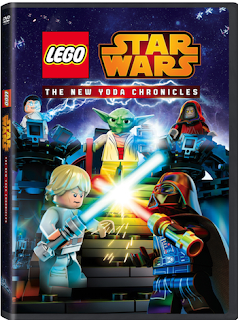 Your favorite Star Wars heroes are back in Lego® Star Wars: The New Yoda Chronicles on DVD September 15th! Unleash the lighter side of the Force with this action packed release that comes with four complete episodes, plus a bonus alternate ending. Unleash the lighter side of the Force and share all of the action packed thrills of these interlocking, intergalactic adventures in LEGO® STAR WARS: The New Yoda Chronicles! Synopsis: Your favorite Star Wars heroes are back with four complete episodes (plus a bonus alternate ending!) that unleash the lighter side of the Force. Bonus Features: Alternate Ending: Clash of the Skywalkers - In this alternate version, will Luke win against the Sith Lord or will Vader be victorious?